This is my daughter Rhealyn and she is 5. 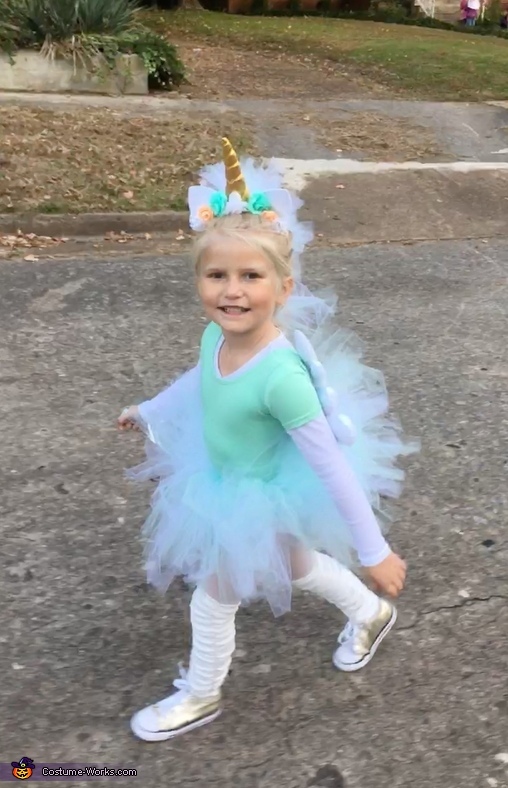 She wanted to be a unicorn and we couldn’t go the basuc “bodysuit with a hood” so this Mom made her the most magical/unique unicorn she could. The body of the costume is a leotard we had purchase for dance the year prior. I found the “angel” wings at bargain hunt and took them off of the horrible metal apparatus they were attached to  and sewed them to the leotard. The horn was a Etsy purchase which is what we based the rest of the costume off of otherwise. The mane and tutu/tail were made from tull and was long with glitter in the back for a “tail” look. The Tull for the mane was tied to her braid. And of course some adorable gold converse to set the look off!!! We both loved it so much!